If only it had a French door with frosted-glass panes ... or an old, chippy-painted screen door ... this would be my dream pantry. House of Smiths needs to come over and do some serious damage in my house. They obviously don't cook - way too neat! Wonder what it looked like after she put the rest of the stuff back in there. And now, I have an insane desire to paint the inside of my pantry some fun and unexpected color. But I have other (actual) rooms higher on the priority list. It's a nice dream, though! Yeah, I'm with you guys on the whole "Where is everything ELSE?" question? 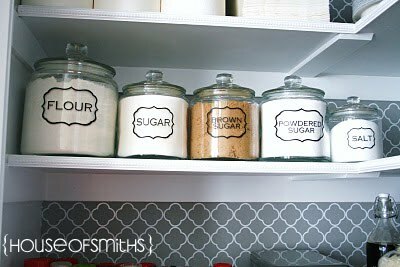 I, too, keep a new bag of flour and sugar, an extra grape jelly, etc., in my pantry, so I have a lot of things that don't fit nicely and neatly into a spot. But more than anything, I was intrigued by the pattern that runs along the back wall now. I can do THAT and love it!